Long-Awaited 180-Acre Non-Gaming Attraction to Become City's "Central Park"
LAS VEGAS, NV--(Marketwire - June 8, 2007) - The Springs Preserve (Preserve), a $250 million non-gaming cultural attraction located a few miles off the Las Vegas Strip, opened Friday after nearly a decade of development. With 180 acres of museums, botanical gardens, galleries, trails and entertainment venues, the Preserve will fill a niche in Las Vegas as a new cultural hub for locals as well as for tourists seeking an off-Strip experience. The new facility is designed to answer the community's call for a cultural and educational gathering place on its most treasured national historic site. Thousands of years ago the Preserve was the site of the first water in the valley and was listed on the National Register of Historic Places in 1978. "The Springs Preserve represents to Las Vegas what Central Park represents to New York," said Springs Preserve director Francis N. Béland. "Not aesthetically, but in what it means to the community from a historic and cultural perspective." The two main galleries of the Preserve, the ORIGEN Experience and the Desert Living Center, take visitors on a fascinating journey through Las Vegas history and introduce them to the latest innovative concepts and tools for living a more eco-friendly lifestyle. 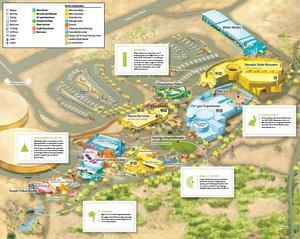 An uncommon blend of interactive and educational experiences for all ages are folded into the visitor experience, which includes: an up-close look at a living bat cave, a brush with a live flash flood, a historic trail walk that passes by a Cienega (desert wetland), or an outdoor cooking demonstration in the botanical gardens. Children can climb aboard a 50-foot rattlesnake replica in the children's playground, visit the Preserve's resource library, master one of the many educational video games in the New Frontier Gallery or trade in their own artifacts at the Nature Exchange for other desired items. Families can cap off their day with a live outdoor concert in the Springs Amphitheater, a light dinner in the Springs Café (operated by Wolfgang Puck) overlooking the Las Vegas Strip, and a casual stroll through the Canary Project photo gallery. "The Preserve has something fun, intriguing and educational for everyone," said Béland. "And the breadth of offerings simply cannot be experienced in a single visit." In addition to the fun elements for visitors, the Preserve is setting new standards for green building in the desert southwest by erecting seven new green buildings. These structures are intended to join an elite list of buildings nationwide that already have achieved "Platinum" Leadership in Energy and Environmental Design (LEED) certification from the U.S. Green Building Council (USGBC). For the Preserve, this translates into creating some of the most energy efficient commercial buildings in the country and the first ever Platinum certified buildings in a visitor attraction. More specifically, this means incorporating innovative green products such as: carpet made from recycled pop bottles, bio-filtration ponds that reclaim on-site wastewater, certified sustainable lumber, rammed earth walls, straw bale walls, and more. An array of eclectic entertainment, activities and musical performances are scheduled for the grand opening weekend through June 10. Visitors attending this weekend will receive a free day pass (one per family) for a future return visit to the Preserve. The Preserve is open seven days a week from 10:00 a.m. to 10:00 p.m. but closed on Thanksgiving and Christmas day. There is an admittance charge to enter the galleries; however, many of the areas of the Preserve are free to the public including the gardens, trails, resource library, café, gift shop and children's playground. General adult admission is $18.95 with discounts for Nevada residents, seniors, students and youth. Children under age 5 are free. The address to the Preserve is 333 S. Valley View Blvd. 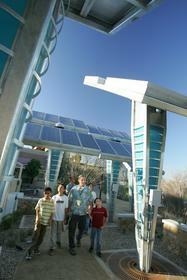 Guests may call (702) 822-8344 for more information or visit www.springspreserve.org. The 76,975 square-foot Desert Living Center (DLC) provides a forum where visitors can learn practical means of protecting valuable environmental resources without compromising their quality of life. A complex of five buildings, the DLC consists of the Sustainability Gallery, dialogue center, design lab and technical training center, and general classroom, conference and office space. The DLC will offer exhibits, classroom programming, events, conferences and activities illustrating the benefits of recycling, conservation and alternative energy sources in a fun and interactive environment for adults and children of all ages. Comprised of two historic museum galleries, an interactive children's gallery and an indoor theater, the 46,610 square-foot ORIGEN Experience is designed to capture the essence of the land and early inhabitants who made the Springs Preserve their home. As the interpretive focal point for history at the Preserve, the ORIGEN Experience galleries convey the natural and cultural history of the Preserve and its common designation as the "birthplace of Las Vegas." 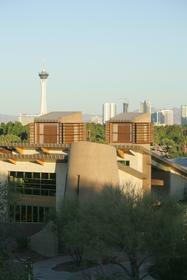 The Springs Preserve is a 180-acre national historic site commonly known as the "birthplace of Las Vegas." This cultural and historic attraction offers a fun, educational and recreational gathering place to commemorate Las Vegas' dynamic history and provide a vision for a sustainable future. The Preserve features a series of historic museums, galleries, outdoor concerts and events, the future Nevada State Museum, an interpretive trail system, a botanical garden and more. For more information about the Springs Preserve, please visit www.springspreserve.org.